It’s always a challenge—matching the effort you put out with the task at hand. Arguably, one ought do their best, right? But what if the task is not that critical? What if “good enough” actually is? We all know people who are so angst ridden about perfection that they can’t get anything done. Perfectionism can be a curse, one that often prevents some people from getting anything started in the first place. Anything! And, we all know the scourge of slap-dash. Personally, I hate undertaking something that comes on the heels of slap-dash, because it means you need to undo before you can get it moving in the right direction. Finding one’s way between the two extremes, and doing so in a way that’s appropriate to the task, is a lifelong balancing act. My current project is refinishing an old oak bathroom vanity. 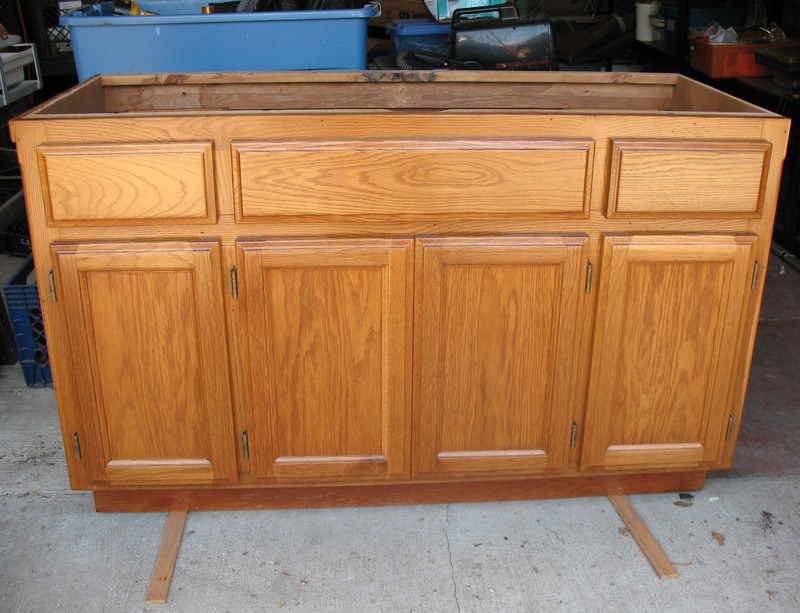 It never was a “joy to behold,” just a serviceable, oak vanity, sold at home improvement stores all over the country when “golden oak” was the remodeling flavor du jour. Rick’s helping, too and I think he’s as torn as I am about it. It’s been stored in a barn for a decade or two, so the old finish is almost falling off. It’s a situation where the bad news is the good news. This finish is so bad that it’s easy to remove. We’ve just spent the day sanding. So I ask you—do we take it to perfection? The vanity will be used in the home of a charming, senior couple who live happily on a fixed income. There’s nothing extra in their budget for big maintenance projects—they’re perfect candidates for the non-profit “fix-it” organization, Rebuilding Together, for which we volunteer. The vanity was an after-thought and is beyond the scope of the original project. So now, we’re scrounging and doing it as cheaply as we can. I searched Craigslist for a couple of weeks—unable to find a replacement cabinet in the size we needed and for what we wanted to spend. It has to be that size or we’ll have to redo the floor, too. Sigh. Anyway, after weeks of looking I finally found this vanity—not on Craigslist, but right under our noses, in one of Elmer’s barns! It was a hundred yards from us the whole time. It’s the perfect size and even matches the existing accessories and trim. Who knew? I talked Elmer into donating it to the cause, and now we have to refinish it. We’ve sanded off what was left of the old finish and removed the water stains. Now we have to put the new finish on it. Just a coat of varnish? Really, to do it right, we should first put on a coat of “golden oak” stain. Not only is that an extra step but, by staining it first, we risk revealing any problems in our sanding and bad areas in the neglected and abused wood. How far do you go to make something (that wasn’t wonderful in the first place) look as good as new? Of course, we’ll stain it. I hate to say it, but we’re going to put in more time than the original manufacturer did making the damn thing. It’s no longer the style—that color. But the fact that it would be truly appreciated makes all the difference. So, we’ll stain and seal it, over the next few days. Then we can go back, install it, and finish the rest of the job. Look up! There’s the photo!